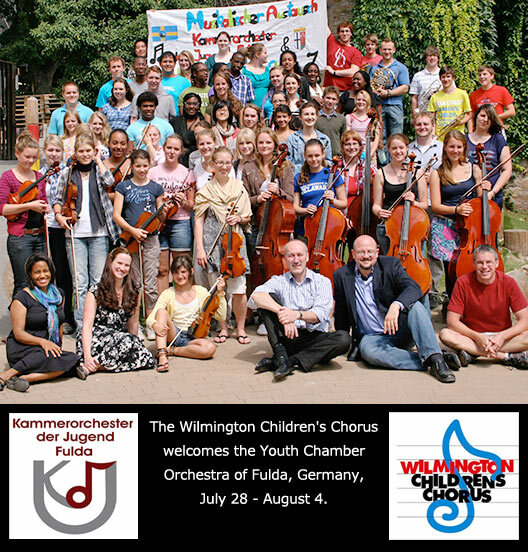 Excitement is building among the 160 youth from the Wilmington Children's Chorus (WCC) and Youth Chamber Orchestra of Fulda, Germany as they are in the midst of the week of a lifetime. A cultural exchange program and music festival that began Sunday, July 28, in Wilmington will culminate with a joint public concert on Saturday, August 3, at 7:30pm at St. Helena's Catholic Church, 602 Philadelphia Pike in Bellefonte. Members of both ensembles have performed at public and private events during the cultural exchange week, including a July 29 Wilmington Blue Rocks game and a gala reception for community leaders at the Delaware Art Museum. The week included daily rehearsal time for choristers and orchestra members, and so much more. The WCC promised its German counterparts a truly American cultural experience featuring a series of fun and educational activities, both in the City of Wilmington and the region. To start, the orchestra and their chaperones enjoyed a pool party and barbecue with WCC at St. Anthony's in the Hills. On July 29, WCC's German guests experienced minor league baseball with the Wilmington Blue Rocks and WCC's Young Men's Ensemble sang The National Anthem prior to the first pitch. Members of both groups entertained audiences at an invitation-only Welcome Reception at the Delaware Art Museum later that weekend. The fun continued with WCC and orchestra members traveling to Cape Henlopen for an all-American beach day, complete with summer sun and an evening clambake as chaperones got a special tour of Delaware's own Dogfish Head Brewery in Milton. Delaware's German-American community welcomed the guests at the Delaware Saengerbund in Newark. The Birthplace of Liberty — Philadelphia — was a stop, with visits to The Constitution Center, Independence Hall, the Liberty Bell and lunch at Reading Terminal Market. Saturday, August 3, will be concert day, and the orchestra will depart on Sunday, August 4, after a morning brunch and musical showcase at Christina Cultural Arts Center. WCC's Artistic Director Kimberly Doucette says the choristers — ranging in age from eight to 18, plus alumni singers from WCC — have set aside weekend and summer activities to practice and prepare for these events. For many choristers, this is the first experience meeting and working with individuals from outside the United States; for others, this event marks an opportunity to reciprocate the hospitality they received from German orchestra members and host families during a 2011 summer tour, which included time in Wilmington's Sister Cities of Fulda, Germany and Nemours, France. "The 2011 visit was life-changing for our choristers and their families," Doucette recalled. "They experienced the pride of representing the City of Wilmington as cultural ambassadors abroad. Our choristers became global citizens and formed lifelong friendships with both the musicians and their host families in Fulda. We cannot wait to welcome the orchestra and their chaperones to Wilmington." "In hosting our German friends, we're building on the success of a wonderful cultural exchange born in 2011," Doucette concluded, "and we're showing children who might never travel overseas the immense value of not just sharing music, but sharing all Wilmington has to offer - here at home and abroad." Both the WCC and The Fulda Youth Orchestra are widely recognized regionally for their commitment to artistic excellence and music education. In Delaware, the WCC enjoys a strong reputation for creating opportunity for local and regional youth. WCC has performed with the Delaware Symphony Orchestra, OperaDelaware, First State Ballet Theatre, the Philadelphia Arab Music Ensemble, and American composer Robert Powell. The Festival was sponsored in part by Sister Cities International of Wilmington, Wawa, The Delaware Division of the Arts, the Christina Cultural Arts Center, the Kenny Family Foundation of ShopRite Supermarkets, and Papa's Pastry in Wilmington. St. Helena's Parish as well as First and Central Presbyterian Church and The Episcopal Church of Saints Andrew and Matthew have generously supported this project by providing rehearsal and performance space. The Delaware Saengerbund provided cultural and language support to the WCC as it prepared for the exchange. The Wilmington Children's Chorus is a multicultural children's choir sponsored by the City of Wilmington, Dennis P. Williams, Mayor, as a project of Cityfest, Inc. Any qualified child can participate for free, regardless of financial or social background.